Since 1986, Total Lawn Care has been serving the outdoor and landscaping needs of homeowners in greater Houston communities, including Cypress, Katy, Champions Forest, Spring, The Woodlands, Atascocita, and Kingwood. Whether you’ve envisioned an exotic backyard paradise or a tranquil garden, our Houston landscaping specialists will create a landscape that works in conjunction with your overall outdoor needs, the unique traits of your site, and the demanding extremes of the Houston climate to give you an easily managed and beautifully structured landscape you can be proud of. At Total Lawn Care, we offer a full array of Houston landscaping services, including landscaping design, hardscape design, irrigation design and repair. If you can envision it, we can create it. Our team of talented landscape and outdoor living specialists will take your landscaping vision and create a design that complements the style and structure of your home to give you a landscape that complements your overall outdoor space. We take great pride in our solid reputation for developing decorative and innovative landscaping designs, as well as our ability to combine style and function to truly reflect the personal style of the homeowner. 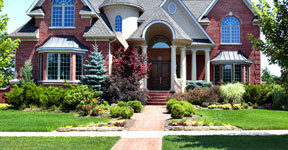 Call us today to schedule an appointment with one of our Houston landscaping design specialists. We’ll meet with you at your home to walk your property, take measurements, make note of any problem areas or issues with your site, and discuss your needs, landscaping ideas and overall plan for your outdoor space.